A Goa'uld mothership appears in Earth's orbit, and SG-1 approaches in a cargo ship to investigate. The ship may be Anubis's mothership which had captured Thor, but it is now apparently deserted, and the self-destruct sequence has been initiated but halted in mid-count. The ship may not be deserted after all, however, as three of Anubis's Ninja Jaffa warriors appear, killing Dr. Friesen, wounding Jacob, and locking the ship's controls into a collision course with Earth. The Jaffa are subdued by Teal'c and Jonas, but the transporter rings are damaged, and the others have no means of escape as the mothership hurtles into the Pacific. Teal'c and Jonas join a rescue mission using a DSRV to retrieve the survivors from the submerged mothership. The ship has suffered structural damage, and O'Neill and Carter are trapped on a level that has begun to flood. There is no way to release the doors to free them, but just as they are about to drown, the doorway opens on its own, allowing them to escape. They discover that Thor's consciousness has remained within the ship's computer, and that it was Thor who forced the Goa'uld to abandon the ship, halted the self-destruct, brought the ship into Earth's orbit, and rescued O'Neill and Carter. SG-1 determines to rescue the crystal matrix containing Thor's consciousness, however, removing the crystals allows the self-destruct sequence to resume. 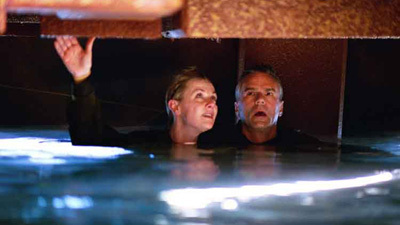 Now SG-1's only means of escape is by using the death gliders, but the force field that would prevent the glider bay from flooding must be activated by a control panel that is now under water. Holding his breath, Jonas maneuvers through the flooded corridor and resets the controls allowing SG-1 access to the glider bay. With only moments left, SG-1 escapes from the submerged ship in the death gliders, just as the destruct sequence detonates, destroying the mothership. The mothership crashed into the Pacific approximately 500-1000 miles west-southwest of Alaska. The crash was explained as a meteor tracked by NORAD that impacted in the north Pacific at 08:00 hours. Three Ninja Jaffa had been sealed in the computer core level. To stay alive as long as possible they had gone into a deep state of kelno’reem, slowing the heart rate to one or two beats per minute, below the ability of sensors to detect life signs. Glider bays have force fields that allow ships to go in and out without having to depressurize the hangar. Although not designed for it, death gliders are capable of operating under water. Although not designed for it, the ring transporter will also operate under water. A DSRV is a Deep Submergence Rescue Vehicle. Lieutenant Dagwood has had prior experience with deep submergence vehicles. O’Neill can pilot a death glider. Jonas can hold his breath under water for a remarkably long period of time, nearly two minutes.